The original predators of the Gremlins, they have been domesticated and turned into fearsome weapons when used against their enemies. Piglets and Warpigs are very similar models in terms of abilities and actions. Where they differ is that a piglet is a smaller, cheaper version of the Warpig. The Piglet has a cost of 4 Soul Stones and a better than average defense of 6, and a lousy willpower of 4. Their 5 wounds will often keep them in the fight when combined with defensive stance. They are a bit slow for the Gremlins faction at a walk of 4-inches; their 8-inch charge range offsets this. The Warpig has a cost of 9 Soul Stones, a good defense of 5, and a very faction average of 4 willpower. They carry 12 wounds, a walk of 5-inches and a charge of 8-inches as well. Both models carry the Pigcharge ability that lets them charge as a (1) Action rather than a (2) Action. They also carry the Set’er Off ability that forces the pig to charge if it is not engaged, or within 2-inches of a friendly Gremlin as long as there is a legal target for the charge. The last area where these models differ is the Piglet carries Small Target whereas the Warpig carries Eat Your Fill. Small Target causes all Sh Attacks to suffer a negative to the duel that helps the Piglet survive to get into engagement range. Eat Your Fill on the Warpig allows it to heal all damage it has suffered and end its activation after killing or sacrificing an enemy model. 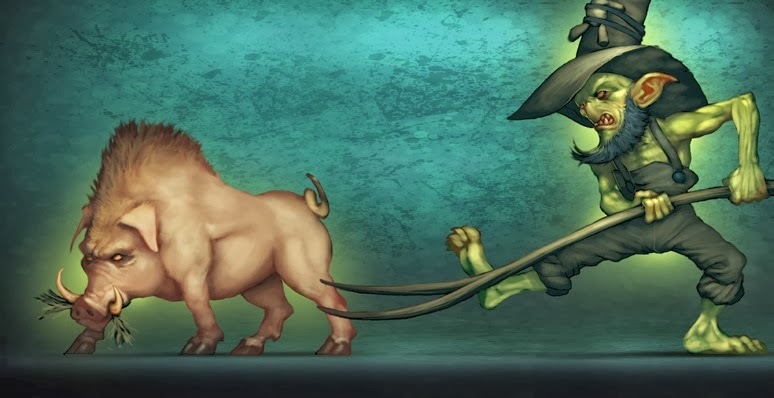 Both Pigs have the same attack and tactical actions just with different names and attack values. The Piglets attack with a stat of 4 while the Warpigs attack with a stat of 6. The Gore attack (Tusks on the Warpig) has a 1-inch range and does 1/2/3 damage (2/4/6 on the Warpig). These attacks must declare triggers, and they have one on every suit similar to the Bayou Gremlins. On a Ram, Stampede, after damaging the model suffers 1 damage and then must charge the closest non-Pig model, which it is not engaged with. This allows the Pig to charge out of combat with one model and into combat with another but can only be declared once per activation to minimize a pinballing Pig wrecking enemy crews. On a Crow, Eat Anything, after damaging they heal 1/2/3 damage. This is great for the Piglet and useful for the Warpig if it cannot kill the model it is engaged with. 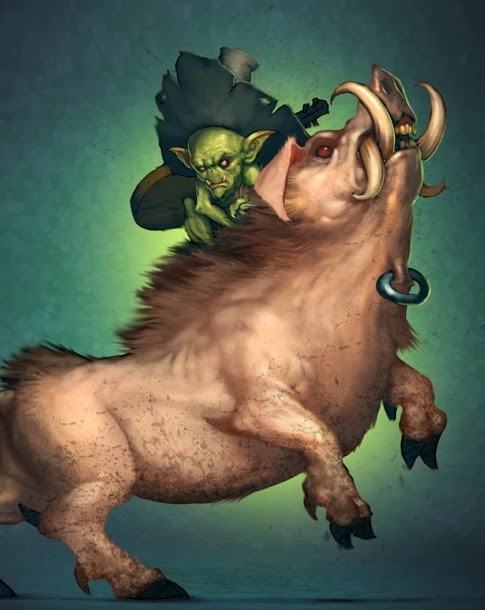 On a Tome, Grab On, This causes the Slow condition on the target and causes the Pig to end its activation. On a Mask, Bowled Over, after you succeed with this attack push the target 4-inches directly away from the pig and then push the pig into base contact. This is useful for getting Line of Sight and Charge lanes to take advantage of with Stampede. They each have a (2) Action attack, Trample, as well both with 1-inch ranges, the Piglet does 2/3/6 damage while the Warpig does 4/5/6 damage. Honestly, I haven’t ever really seen a use for these actions though I am by no means an expert in Pigs. The only Tactical Action that the Pigs carry is Truffles; this is a Ca of 4 with a TN of 10. It allows a target friendly Gremlin within 8-inches to be pushed its Wk toward the Pig casting this spell. This is useful for repositioning Slop Haulers and Hog Whisperers to be able to ignore the Set’er Off ability. Pigs can be a useful model but you must build a crew with them in mind. Be aware of the Set’er Off ability because it can be easy to put your own models in danger from a Pigcharge. Warpigs are a serious threat and when they get to the enemy, they often will do a lot of damage to the enemy crew. Piglets, combined with Bayous, can lead to the out activation of the enemy. This crew build allows the pigs to Stampede into the enemy with no chance for a response from the enemy. Be aware of the beast characteristic when facing Arcanist crews, when facing Marcus they are are better left out of the crew.